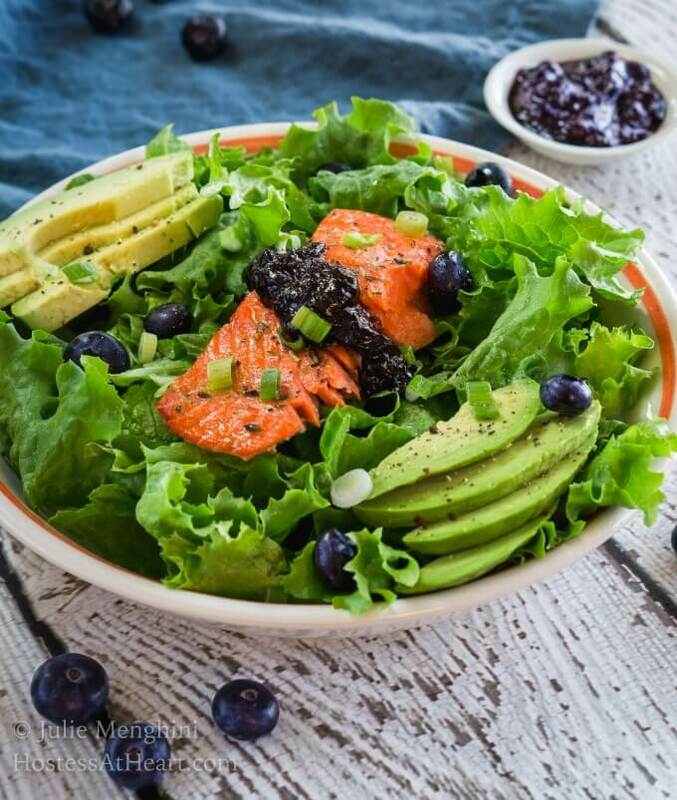 This Superfood Salmon Salad with Balsamic Blueberry Sauce is a complete meal that only takes 20 minutes to make. It’s perfect for guests or a weeknight meal! 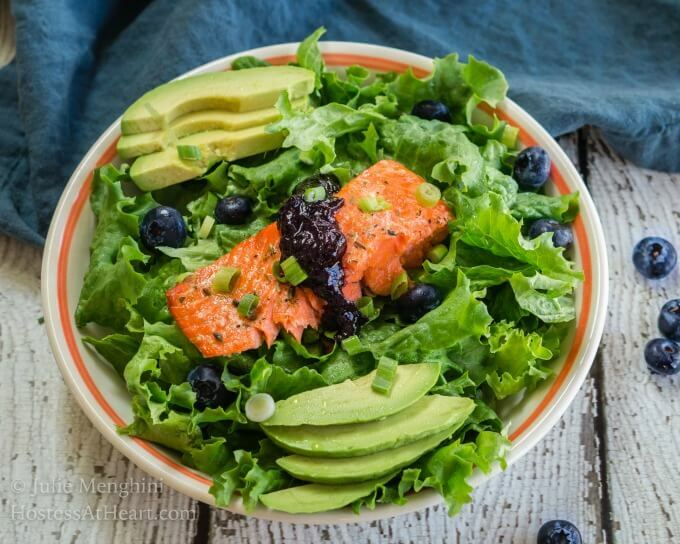 Superfood Salmon Salad with Balsamic Blueberry Sauce is delicious and looks complicated. This beautiful dish is perfect for entertaining or a weeknight dinner. This salmon was cooked perfectly and the blueberry sauce is just decadent without all of the fat and sugar that’s in a lot of sauces. John and I try pretty hard to watch what we eat. Every once in a while we go off the deep end for a few days at a time. You’ve seen the evidence like my Triple Chocolate Caramel Cookie Bars and Decadent Dark Chocolate Tart right? Well after a few days we’re ready to get back on track with meals like this Superfood Salmon Salad with Balsamic Blueberry Sauce. Blueberries contain the highest antioxidants of all fruit and vegetables. Antioxidants prevent cell damage and help fight disease. Avocados contain healthy fats that help reduce cholesterol levels which may help prevent diseases in your heart and brain. Salmon contains Omega 3 fatty acids that our bodies can’t produce. It also reduces inflammation and improves circulation. Reading this article it didn’t take long to come up with this dish that combines many of these superfoods. This recipe has other health benefits such as plenty of fiber and low in sugar. Best of all it’s delicious which proves foods that are good for you can taste good too. Don’t forget to Pin this recipe to your favorite Pinterest Board! Beets are high in nitrate levels which can lower your blood pressure and amino acid which are a natural anti-depressant. Black Beans supply an ample amount of protein, fiber, and iron. Fish Turner – I use this turner for everything! It should be calle1d a food flipper! It’s indispensable for browning meat or serving delicate pieces of fish! Here are a few other delicious recipes that are guilt-free! This Superfood Salmon Salad with Balsamic Blueberry Sauce is a complete meal that only takes 20 minutes to make. It's perfect for guests or a weeknight meal! In a medium-sized saucepan combine Balsamic Blueberry Sauce ingredients. Heat on medium-low until reduced in half, approximately 20 minutes. Watch closely towards the end of cooking to prevent burning. Lightly mash any remaining whole berries. The sauce will thicken as it cools. Place the salmon on the rimmed baking sheet skin-side down. Drizzle lightly with olive oil. Salt and pepper lightly. Bake 12 to 15 minutes or until an instant-read thermometer measure 120°F and fish is flaky. I removed the foil from the pan with the fish on it immediately to stop any further cooking. Fill plates with lettuce and any other desired ingredients such as nuts, green onions, or additional blueberries. Top with salmon and a spoonful the balsamic blueberry sauce. Salad can be spritzed with additional olive oil and balsamic or a vinaigrette if desired. 2 cups are considered a portion of lettuce but feel free to fill up that bowl. What a gorgeous salad! I love the combination of flavors! Thank you, Sandra! I need to cook salmon more often! So simple and fresh… I love fresh fruits and greens with salmon! Can’t wait to try your Balsamic Blueberry Sauce! Yum! I cannot WAIT to try this recipe!! It looks sensational! We have some fresh scallops that Ive been looking for ideas to make… I think I’ll try your salad and sub them for the salmon! I love this dressing recipe! Thank you, Michele! John and I love scallops and I haven’t made them in a while. that would be a great idea! Thanks for this gorgeous and healthy salmon dish! This seafood is a personal favorite of mine and I love the combination of flavors you have created here, especially the balsamic blueberry sauce; heavenly! Thank you, Dan! This is such an easy dish to make too! That’s just perfection! My kind of meal. Thank you Mimi! I really need to cook more salmon. We love it when I do. How gorgeous! Bright fresh flavors. What a perfect meal my friend! Thank you so much, Angela! Your dishes are always one of my inspirations to keep my food real! This salad looks amazing! The salmon is perfectly cooked. The blueberry sauce is rich and flavorful. And I love that you added avocados! Yum. Maybe I’ll toss a little quinoa on it as well. Yum! Thank you Debi! I was thinking of adding some tri-colored quinoa too! A perfect meal for me. Love salmon cooked so many ways. I like your sauce better than the one I have – balsamic vinegar adds a little pizzazz to the blueberries. Thank you Judi! We really enjoyed this dish and I loved how quickly it can be put together. Thank you so much, Loretta! I like salmon probably a little better than a lot of fish and that it comes together so quickly. The blueberry sauce would be good on so many things too!